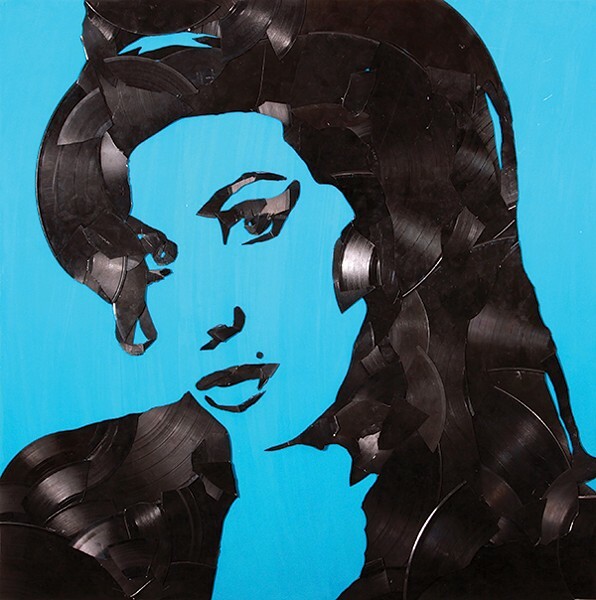 Amy Winehouse, Greg Frederick, vinyl records on canvas, 24” x 24”, 2012. About three years ago, Greg Frederick started breaking old records that were lying around his Brooklyn apartment. "I don't use vinyl that are playable," says Frederick. "I don't want to break anything that doesn't need to be broken." But Frederick only breaks records in order to put them back together—granted in a very different form. His collection of portraits, mostly of iconic musicians, feature fragments of vinyl from LPs and 45s, paper sleeves and all. "Record Breaker," featuring selections from his Vinyl Pop Art series, will be on display at Orphic Gallery in Roxbury though June 30. The combination of Frederick's interest in found objects and street art informs his distinctive style, which creates a 3-D visual experience for viewers. 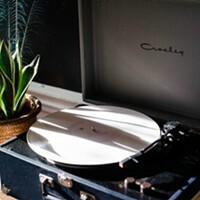 "When [the vinyl fragments] lay on top of each other, they have a really nice texture," he says. Frederick starts with a photograph (his background is in photography), prints the photo to canvas, paints the print, and then adds layers of vinyl shards and sleeves, sometimes with other materials, like stencils and glitter. One of his most well-known pieces is called Idolize This, a mash-up of Kim Kardashian and Mother Theresa. "I remember my mom telling me about Mother Theresa as a kid," says Frederick. "When I call my mom now, she asks 'Did you hear about Kim Kardashian?' Why are we talking about her, and not Mother Theresa anymore?" Though Frederick mostly chooses people and artists that he likes for his portraits, he created some special, large-format pieces for the Orphic Gallery exhibit that have local resonance. 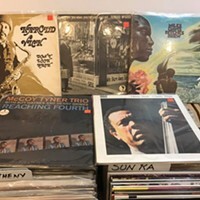 "I asked Phil [Lenahan] at Orphic if he had any suggestions of artists that people in the area really like, and he exposed me to three or four that I had never heard of before. I researched them and became a fan." One of Frederick's newfound artists? Levon Helm. "Record Breaker" will be on display at Orphic Gallery in Roxbury through June 30. 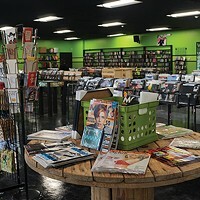 (607) 326-6045; Orphicgallery.com/gallery. Portfolio: Vinylpopart.com.